This page describes the arms and armour crafted by Hephaistos for the kings and heroes of myth. The most famous of these artifacts were the armours of Herakles and Akhilleus (Achilles). The first "Works" page describes other creations of the god including palaces, animated statues, chariots, jewellery, cups and bowls. ARROWS OF APOLLON & ARTEMIS The twin archer-gods had their arrows forged by Hephaistos. THUNDERBOLTS OF ZEUS The thunderbolts of Zeus were usually said to be forged by the three Kyklopes, only rarely was Hephaistos named as their artificer. SPEARS & SWORDS OF THE KABEIROI (Cabeiri) Hephaistos crafted weapons for his sons the Kabeiroi gods of Lemnos. KNIFE OF PERSEUS The adamantine blade with which Perseus beheaded the Gorgon Medousa was said to have been crafted by Hephaistos. 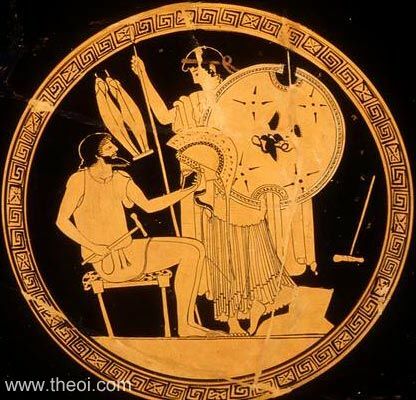 SPEAR & KNIFE OF PELEUS Hephaistos and Athena presented the Phthian hero Peleus with the gift of a spear at his marriage to Thetis. The same spear was employed by his son Akhilleus in the Trojan War. AIGIS OF ZEUS The shaggy goat-skin Aigis breastplate was said to have been created for Zeus or Athena by Hephaistos. ARMOUR & SHIELD OF HERAKLES Herakles received a golden breastplate and fabulous shield from the god Hephaistos. QUIVER OF HERAKLES The richly decorated quiver of Herakles was crafted by Hephaistos. Philoktetes possessed it and the hero's bow at the time of the Trojan War. ARMOUR & SHIELD OF AKHILLEUS (Achilles) Thetis petitioned Hephaistos to forge a new set of armour for her son Akhilleus, after his father's set was captured by Hektor during the Trojan War. CORSELET OF DIOMEDES Diomedes a hero of the Trojan War was described as possessing a corselet crafted by Hephaistos. ARMOUR OF MEMNON Eos had Hephaistos forge armour for her son Memnon before he entered the Trojan War. ARMOUR OF AENEAS Aphrodite persuaded her husband Hephaistos to forge a set of armour for her son Aeneas after his arrival in Latium and preparation for war. "Latona [Leto], clinging to an olive tree, bore Apollo and Diana [Artemis], to whom Vulcanus [Hephaistos] gave arrows as gifts [i.e. on the day of their birth]. Four days after they were born, Apollo exacted vengeance for his mother. For he went to Parnassus and slew Python with his arrows." "That god [Hephaistos] . . . who fashions the three-forked thunderbolts, yea, he who tends the hot furnaces ever raging 'neath Aetna's peaks." "In his right hand he [the Kabeiros Eurymedon] held a Lemnian spear made on his father's [Hephaistos'] anvil, and by his wellmade thigh hung a flashing sword--if a man picked up a small stone in his fingertips and struck it against the fire-grained surface of the sharp blade, sparks flashed of themselves from the steel. Alkon grasped a fiery bolt in one hand." "In front of him went Phoibos Apollon wearing a mist about his shoulders, and held the tempestuous terrible aegis, shaggy, conspicuous, that the bronze-smith (khalkeus) Hephaistos had given Zeus to wear to the terror of mortals." "Some [of the Kyklopes in the service of Hephaistos] busily burnished the aegis Athene wears in her angry moods--a fearsome thing with a surface of gold like scaly snake-skin, and he linked serpents and the Gorgon herself upon the goddess' breast--a severed head rolling its eyes." "He [Perseus] is said to have received from Volcanus [Hephaistos] a knife made out of adamant, with which he killed Medusa the Gorgon." "At the marriage of Peleus and Thetis, the gods gathered together on Pelion to feast and brought Peleus gifts. Kheiron gave him a stout ashen shaft which he had cut for a spear, and Athena, it is said, polished it, and Hephaistos fitted it with a head. The story is given by the author of the Kypria." "The beautiful knife [of Peleus] which the very famous Lame One (periklytos Amphigueeis) had made for him." "[From a description of the Kalydonian Boar Hunt:] Peleus holds in his hand the sword given him by Hephaistos, as he awaits the rush of the boar." "Peleus, it is said, received on the occasion of his marriage [to Thetis] a sword from Hephaistos." "Diomedes, breaker of horses, [wore] that elaborate corselet that Hephaistos wrought with much toil." "I'm asking a deity whom I reverence for arms . . . You [Hephaistos] were moved by the tears of Thetis once, and the tears of [Eos] the wife of Tithonus [i.e. to provide their sons Akhilleus and Memnon with arms]." "[Herakles] put upon his legs greaves of shining bronze, the splendid gift of Hephaistos. Next he fastened about his breast a fine golden breast-plate, curiously wrought, which Pallas Athene the daughter of Zeus had given him when first he was about to set out upon his grievous labours. "Over his shoulders the fierce warrior put the steel that saves men from doom, and across his breast he slung behind him a hollow quiver. Within it were many chilling arrows, dealers of death which makes speech forgotten: in front they had death, and trickled with tears; their shafts were smooth and very long; and their butts were covered with feathers of a brown eagle. "And he took his strong spear, pointed with shining bronze, and on his valiant head set a well-made helm of adamant, cunningly wrought, which fitted closely on the temples; and that guarded the head of god-like Herakles. "and upon his grim brow hovered frightful Eris (Strife) who arrays the throng of men: pitiless she, for she took away the mind and senses of poor wretches who made war against the son of Zeus. Their souls passed beneath the earth and went down into the house of Aides; but their bones, when the skin is rotted about them, crumble away on the dark earth under parching Seirios. "Upon the shield Proioxis ( Pursuit) and Palioxis ( Flight) were wrought, and Homados (Tumult), and Phobos (Panic), and Androktasie (Slaughter). Eris (Strife) also, and Kydoimos ( Uproar) were hurrying about, and deadly Ker (Death-Fate) was there holding one man newly wounded, and another unwounded; and one, who was dead, she was dragging by the feet through the tumult. She had on her shoulders a garment red with the blood of men, and terribly she glared and gnashed her teeth. the diviner, Arktos, and Oureus, and black-haired Mimas, and the two sons of silver, and they had pinetrees of gold in their hands, and they were rushing together as though they were alive and striking at one another hand to hand with spears and with pines. And on the shield stood the fleet-footed horses of grim Ares made gold, and deadly Ares the spoil-winner himself. He held a spear in his hands and was urging on the footmen: he was red with blood as if he were slaying living men, and he stood in his chariot. Beside him stood Deimos (Fear) and Phobos (Flight), eager to plunge amidst the fighting men. There, too, was the daughter of Zeus, Tritogeneia [Athene] who drives the spoil. She was like as if she would array a battle, with a spear in her hand, and a golden helmet, and the aigis about her shoulders. And she was going towards the awful strife. And there was the holy company of the deathless gods : and in the midst [Apollon] the son of Zeus and Leto played sweetly on a golden lyre. There also was the abode of the gods, pure Olympos, and their assembly, and infinite riches were spread around in the gathering, the Mousai Pierides were beginning a song like clear-voiced singers. circle, and it seemed to heave with waves. In the middle of it were many dolphins rushing this way and that, fishing: and they seemed to be swimming. Two dolphins of silver were spouting and devouring the mute fishes. And beneath them fishes or bronze were trembling. And on the shore sat a fisherman watching: in his hands he held a casting net for fish, and seemed as if about to cast it forth. There, too, was the son of rich-haired Danae, the horseman Perseus: his feet did not touch the shield and yet were not far from it--very marvellous to remark, since he was not supported anywhere; for so did the famous Lame One (klytos Amphigueeis) fashion him of gold with his hands. On his feet he had winged sandals, and his black-sheathed sword was slung across his shoulders by a cross-belt of bronze. He was flying swift as thought. The head of a dreadful monster, the Gorgon, covered the broad of his back, and a bag of silver--a marvel to see--contained it: and from the bag bright tassels of gold hung down. Upon the head of the hero lay the dread cap of Haides which had the awful gloom of night. Perseus himself, the son of Danae, was at full stretch, like one who hurries and shudders with horror. And after him rushed the Gorgones, unapproachable and unspeakable, longing to seize him: as they trod upon the pale adamant, the shield rang sharp and clear with a loud clanging. Two serpents hung down at their girdles with heads curved forward: their tongues were flickering, and their teeth gnashing with fury, and their eyes glaring fiercely. And upon the awful heads of the Gorgones great Phobos (Fear) was quaking. And beyond these there were men fighting in warlike harness, some defending their own town and parents from destruction, and others eager to sack it; many lay dead, but the greater number still strove and fought. The women on well-built towers of bronze were crying shrilly and tearing their cheeks like living beings--the work of famous Hephaistos. And the men who were elders and on whom age had laid hold were all together outside the gates, and were holding up their hands to the blessed gods, fearing for their own sons. But these again were engaged in battle : and behind them the dusky Keres (Fates), gnashing their white fangs, lowering, grim, bloody, and unapproachable, struggled for those who were falling, for they all were longing to drink dark blood. So soon as they caught a man overthrown or falling newly wounded, one of them would clasp her great claws about him, and his soul would go down to Haides to chilly Tartaros. And when they had satisfied their souls with human blood, they would cast that one behind them, and rush back again into the tumult and the fray. Klotho and Lakhesis were over them and Atropos less tall than they, a goddess of no great frame, yet superior to the others and the eldest of them. And they all made a fierce fight over one poor wretch, glaring evilly at one another with furious eyes and fighting equally with claws and hands. By them stood Akhlys (Darkness of Death), mournful and fearful, pale, shrivelled, shrunk with hunger, swollen-kneed. Long nails tipped her hands, and she dribbled at the nose, and from her cheeks blood dripped down to the ground. She stood leering hideously, and much dust sodden with tears lay upon her shoulders. Others again were mounted on horseback and galloping before the town. And there were ploughmen breaking up the good soul, clothed in tunics girt up. Also there was a wide cornland and some men were reaping with sharp hooks the stalks which bended with the weight of the cars--as if they were reaping Demeter's grain: others were binding the sheaves with bands and were spreading the threshing floor. And some held reaping hooks and were gathering the vintage, while others were taking from the reapers into baskets white and black clusters from the long rows of vines which were heavy with leaves and tendrils of silver. Others again were gathering them into baskets. Beside them was a row of vines in gold, the splendid work of cunning Hephaistos: it had shivering leaves and stakes of silver and was laden with grapes which turned black. And there were men treading out the grapes and others drawing off liquor. Also there were men boxing and wrestling, and huntsmen chasing swift hares with a leash of sharp-toothed dogs before them, they eager to catch the hares, and the hares eager to escape. Next to them were horsemen hard set, and they contended and laboured for a prize. The charioteers standing on their well-woven cars, urged on their swift horses with loose rein; the jointed cars flew along clattering and the naves of the wheels shrieked loudly. So they were engaged in an unending toil, and the end with victory came never to them, and the contest was ever unwon. And there was set out for them within the course a great tripod of gold, the splendid work of cunning Hephaistos. And round the rim Okeanos was flowing, with a full stream as it seemed, and enclosed all the cunning work of the shield. Over it swans were soaring and calling loudly, and many others were swimming upon the surface of the water; and near them were shoals of fish. 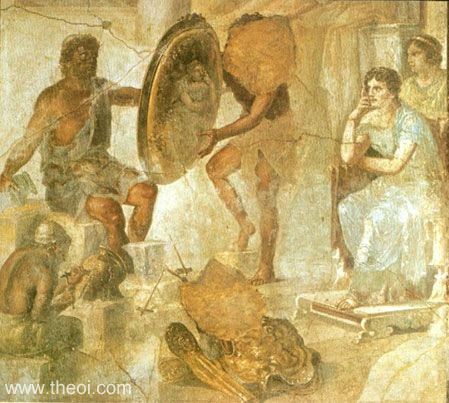 A wonderful thing the great strong shield was to see--even for Zeus the loud-thunderer, by whose will Hephaistos made it and fitted it with his hands. This shield the valiant son of Zeus wielded masterly, and leaped upon his horse-chariot." The quiver of Herakles is also mentioned briefly in the passage from the Shield of Heracles quoted above. "[Philoktetes] whose limbs were clad in mighty Herakles' arms [his bow and quiver] of cunning workmanship; for on the belt gleamed bears most grim and savage, jackals fell, and panthers, in whose eyes there seems to lurk a deadly smile. There were fierce-hearted wolves, and boars with flashing tusks, and mighty lions all seeming strangely alive; and, there portrayed through all its breadth, were battles murder-rife. With all these marvels covered was the belt; and with yet more the quiver was adorned. There Hermes was, storm-footed Son of Zeus, slaying huge Argos nigh to Inakhos' streams, Argos, whose sentinel eyes in turn took sleep. And there was Phaethon from the Sun-car hurled into Eridanus. Earth verily seemed ablaze, and black smoke hovered on the air. There Perseus slew Medousa gorgon-eyed by the stars' baths and utmost bounds of earth and fountains of deep-flowing Okeanos, where night in the far west meets the setting sun. There was the Titan Iapetos' great son [Prometheus] hung from the beetling crag of Kaukasos in bonds of adamant, and the eagle tare his liver unconsumed--he seemed to groan! All these Hephaistos' cunning hands had wrought for Herakles; and these to Poias' son [Philoktetes], most near of friends and dear, he gave to bear." "[Hephaistos] went to his bellows [to forge armour for Akhilleus]. He turned these toward the fire and gave them their orders for working. And the bellows, all twenty of them, blew on the crucibles, from all directions blasting forth wind to blow the flames high now as he hurried to be at this place and now at another, wherever Hephaistos might wish them to blow, and the work went forward. He cast on the fire bronze which is weariless, and tin with it and valuable gold, and silver, and thereafter set forth upon its standard the great anvil, and gripped in one hand the ponderous hammer, while in the other he grasped the pincers. "First of all he forged a shield that was huge and heavy, elaborating it about, and threw around it a shining triple rim that glittered, and the shield strap was cast of silver. There were five folds composing the shield itself, and upon it he elaborated many things in his skill and craftsmanship. He made the earth upon it, and the sky, and the sea's water, and the tireless sun, and the moon waxing into her fullness, and on it all the constellations that festoon the heavens, the Pleiades and the Hyades and the strength of Orion and the Bear . . .
On it he wrought in all their beauty two cities of mortal men. And there were marriages in one, and festivals. They were leading the brides along the city from their maiden chambers under the flaring of torches, and the loud bride song was arising. The young men followed the circles of the dance, and among them the flutes and lyres kept up their clamour as in the meantime the women standing each at the door of her court admired them. The people were assembled in the market place, where a quarrel had arisen, and two men were disputing over the blood price for a man who had been killed. One man promised full restitution in a public statement, but the other refused and would accept nothing. Both then made for an arbitrator, to have a decision; and people were speaking up on either side, to help both men. But the heralds kept the people in hand, as meanwhile the elders were in session on benches of polished stone in the sacred circle and held in their hands the staves of the heralds who lift their voices. The two men rushed before these, and took turns speaking their cases, and between them lay on the ground two talents of gold, to be given to that judge who in this case spoke the straightest opinion. But around the other city were lying two forces of armed men shining in their war gear. For one side counsel was divided whether to storm and sack, or share between both sides the property and all the possessions the lovely citadel held within it. But the city's people were not giving way, and armed for an ambush. Their beloved wives and their little children stood on the rampart to hold it, and with them the men with age upon them, but meanwhile the others went out. And Ares led them, and Pallas Athene. These were gold, both, and golden raiment upon them, and they were beautiful and huge in their armour, being divinities, and conspicuous from afar, but the people around them were smaller. These, when they were come to the place that was set for their ambush, in a river, where there was a watering place for all animals, there they sat down in place shrouding themselves in the bright bronze. But apart from these were sitting two men to watch for the rest of them and waiting until they could see the sheep and the shambling cattle, who appeared presently, and two herdsmen went along with them playing happily on pipes, and took no thought of the treachery. Those others saw them, and made a rush, and quickly thereafter cut off on both sides the herds of cattle and the beautiful flocks of shining sheep, and killed the shepherds upon them. But the other army, as soon as they heard the uproar arising from the cattle, as they sat in their councils, suddenly mounted behind their light-foot horses, and went after, and soon overtook them. These stood their ground and fought a battle by the banks of the river, and they were making casts at each other with their spears bronze-headed; and Eris (Hate) was there with Kydoimos (Confusion) among them, and Ker (Death) the destructive; she was holding a live man with a new wound, and another one unhurt, and dragged a dead man by the feet through the carnage. The clothing upon her shoulders showed strong red with the men's blood. All closed together like living men and fought with each other and dragged away from each other the corpses of those who had fallen. He made upon it a soft field, the pride of the tilled land, wide and triple-ploughed, with many ploughmen upon it who wheeled their teams at the turn and drove them in either direction. And as these making their turn would reach the end-strip of the field, a man would come up to them at this point and hand them a flagon of honey-sweet wine, and they would turn again to the furrows in their haste to come again to the end-strip of the deep field. The earth darkened behind them and looked like earth that has been ploughed though it was gold. Such was the wonder of the shield's forging. He made on it the precinct of a king, where the labourers were reaping, with the sharp reaping hooks in their hands. Of the cut swathes some fell along the lines of reaping, one after another, while the sheaf-binders caught up others and tied them with bind-ropes. There were three sheaf-binders who stood by, and behind them were children picking up the cut swathes, and filled their arms with them and carried and gave them always; and by them the king in silence and holding his staff stood near the line of the reapers, happily. And apart and under a tree the heralds made a feast ready and trimmed a great ox they had slaughtered. Meanwhile the women scattered, for the workmen to eat, abundant white barley. He made on it a great vineyard heavy with clusters, lovely and in gold, but the grapes upon it were darkened and the vines themselves stood out through poles of silver. About them he made a field-ditch of dark metal, and drove all around this a fence of tin; and there was only one path to the vineyard, and along it ran the grape-bearers for the vineyard's stripping. Young girls and young men, in all their light-hearted innocence, carried the kind, sweet fruit away in their woven baskets, and in their midst a youth with a singing lyre played charmingly upon it for them, and sang the beautiful song for Linos in a light voice, and they followed him, and with singing and whistling and light dance-steps of their feet kept time to the music. He made upon it a herd of horn-straight oxen. The cattle were wrought of gold and of tin, and thronged in speed and with lowing out of the dung of the farmyard to a pasturing place by a sounding river, and beside the moving field of a reed bed. The herdsmen were of gold who went along with the cattle, four of them, and nine dogs shifting their feet followed them. But among the foremost of the cattle two formidable lions had caught hold of a bellowing bull, and he with loud lowings was dragged away, as the dogs and the young men went in pursuit of him. But the two lions, breaking open the hide of the great ox, gulped the black blood and the inward guts, as meanwhile the herdsmen were in the act of setting and urging the quick dogs on them. But they, before they could get their teeth in, turned back from the lions, but would come and take their stand very close, and bayed, and kept clear. And the renowned smith of the strong arms made on it a meadow large and in a lovely valley for the glimmering sheep flocks, with dwelling places upon it, and covered shelters, and sheepfolds. And the renowned smith of the strong arms made elaborate on it a dancing floor, like that which once in the wide spaces of Knosos Daidalos built for Ariadne of the lovely tresses. And there were young men on it and young girls, sought for their beauty with gifts of oxen, dancing, and holding hands at the wrist. These wore, the maidens long light robes, but the men wore tunics of finespun work and shining softly, touched with olive oil. And the girls wore fair garlands on their heads, while the young men carried golden knives that hung from sword-belts of silver. At whiles on their understanding feet they would run very lightly, as when a potter crouching makes trial of his wheel, holding it close in his hands, to see if it will run smooth. At another time they would form rows, and run, rows crossing each other. And around the lovely chorus of dancers stood a great multitude happily watching, while among the dancers two acrobats led the measures of song and dance revolving among them. He made on it the great strength of the River Okeanos which ran around the uttermost rim of the shield's strong structure. "Then after he had wrought this shield, which was huge and heavy, he wrought for him a corselet brighter than fire in its shining, and wrought him a helmet, massive and fitting close to his temples, lovely and intricate work, and laid a gold top-ridge along it, and out of pliable tin wrought him leg-armour. "Thereafter when the renowned smith of the strong arms (periklytos Amphigueeis) had finished the armour he lifted it and laid it before the mother of Akhilleus. And she like a hawk came sweeping down from the snows of Olympos and carried with her the shining armour, the gift of Hephaistos. The goddess spoke so, and set down the armour on the ground before Akhilleus, and all its elaboration clashed loudly. Trembling took hold of all the Myrmidones. None had the courage to look straight at it. They were afraid of it. Only Akhilleus looked, and as he looked the anger came harder upon him and his eyes glittered terribly under his lids, like sunflare. He was glad, holding in his hands the shining gifts of Hephaistos. But when he had satisfied his heart with looking at the intricate armour, he spoke to his mother and addressed her in winged words : ‘My mother, the god has given me these weapons; they are such as are the work of immortals. No mortal man could have made them. Therefore now I shall arm myself in them.’"
"[Akhilleus] raging at the Trojans he put on the gifts of the god, that Hephaistos wrought for him with much toil. First he placed along his legs the fair greaves linked with silver fastenings to hold the greaves at the ankles. Afterward he girt on about his chest the corselet, and across his shoulders lung the sword with the nails of silver, a bronze sword, and caught up the great shield, huge and heavy next, and from it the light glimmered far, as from the moon . . . the light from the fair elaborated shield of Akhilleus shot into the high air. And lifting the helm he set it massive upon his head, and the helmet crested with horse-hair shone like a star, the golden fringes were shaken about it which Hephaistos had driven close along the horn of the helmet. And brilliant Akhilleus tried himself in his armour, to see if it fitted close, and how his glorious limbs ran within it, and the armour became as wings and upheld the shepherd of the people." "On the terrible grim shield [of Akhilleus] [Aineias] drove the ponderous pike, so that the great shield moaned as it took the spearhead. The son of Peleus with his heavy hand held the shield away from him, in fright, since he thought the far-shadowing spear of great-hearted Aineias would lightly be driven through it. Fool, and the heart and spirit in him could not understand how the glorious gifts of the gods are not easily broken by mortal men, who such gifts will not give way before them. Not this time could the ponderous spear of war-wise Aineias smash the shield, since the gold stayed it, the god's gift. Indeed he did drive the spear through two folds, but there were three left still, since the god of the dragging feet had made five folds on it, and between them the single gold, and in this the ash spear was held fast." "In front of his [Akhilleus'] chest the beautiful elaborate great shield covered him, and with the glittering helm with four horns he nodded; the lovely golden fringes were shaken about it which Hephaistos had driven close along the horn of the helmet." "[Amongst the scenes depicted on the chest of Kypselos dedicated at Olympia:] Thetis is receiving the armour from Hephaestus. And moreover, he who is giving the armour is not strong upon his feet, and a slave follows him behind, holding a pair of fire-tongs." "[Homer] compares the dance worked by Hephaistos on the shield of Akhilleus to a dance made by Daidalos, because he had never seen more clever workmanship." 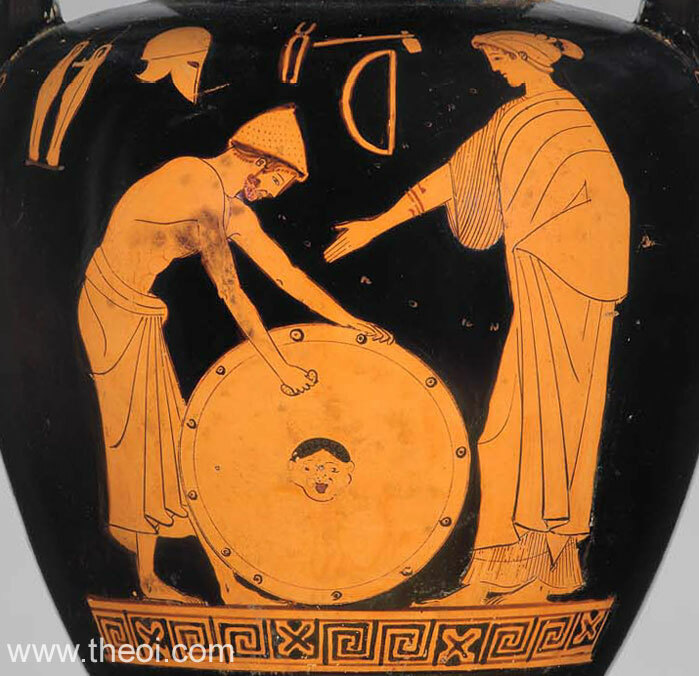 "Homer shows that he knew that the sufferings of Linos were the theme of a Greek song when he says that Hephaistos, among the other scenes he worked upon the shield of Akhilleus, represented a boy harpist singing the Linos song." "So when all other contests had an end [at the Funeral Games of Akhilleus], Thetis the Goddess laid down in the midst great-souled Akhilleus' arms divinely wrought; and all around flashed out the cunning work wherewith Hephaistos overchased the shield fashioned for Aiakos' son, the dauntless-souled. "Inwrought upon that labour of a God were first high heaven and cloudland, and beneath lay earth and sea: the winds, the clouds were there, the moon and sun, each in its several place; there too were all the stars that, fixed in heaven, are borne in its eternal circlings round. Above and through all was the infinite air where to and fro flit birds of slender beak: thou hadst said they lived, and floated on the breeze. Here Tethys' all-embracing arms were wrought, and Okeanos' fathomless flow. The outrushing flood of rivers crying to the echoing hills all round, to right, to left, rolled o'er the land. Round it rose league-long mountain-ridges, haunts of terrible lions and foul jackals: there fierce bears and panthers prowled; with these were seen wild boars that whetted deadly-clashing tusks in grimly-frothing jaws. There hunters sped after the hounds: beaters with stone and dart, to the life portrayed, toiled in the woodland sport. And there were man-devouring wars, and all Horrors of fight: slain men were falling down mid horse-hoofs; and the likeness of a plain blood-drenched was on that shield invincible. Panic was there, and Dread, and ghastly Enyo with limbs all gore-bespattered hideously, and deadly Strife, and the Avenging Spirits fierce-hearted--she, still goading warriors on to the onset they, outbreathing breath of fire. Around them hovered the relentless Fates; beside them Battle incarnate onward pressed yelling, and from their limbs streamed blood and sweat. There were the ruthless Gorgones : through their hair horribly serpents coiled with flickering tongues. A measureless marvel was that cunning work of things that made men shudder to behold seeming as though they verily lived and moved. And while here all war's marvels were portrayed, yonder were all the works of lovely peace. The myriad tribes of much-enduring men dwelt in fair cities. Justice watched o'er all. To diverse toils they set their hands; the fields were harvest-laden; earth her increase bore. Most steeply rose on that god-laboured work the rugged flanks of holy Arete's (Honour's) mount, and there upon a palm-tree throned she sat exalted, and her hands reached up to heaven. All round her, paths broken by many rocks thwarted the climbers' feet; by those steep tracks daunted ye saw returning many folk: few won by sweat of toil the sacred height. And there were reapers moving down long swaths swinging the whetted sickles: 'neath their hands the hot work sped to its close. Hard after these many sheaf-binders followed, and the work grew passing great. With yoke-bands on their necks oxen were there, whereof some drew the wains heaped high with full-eared sheaves, and further on were others ploughing, and the glebe showed black behind them. Youths with ever-busy goads followed: a world of toil was there portrayed. And there a banquet was, with pipe and harp, dances of maids, and flashing feet of boys, all in swift movement, like to living souls. Hard by the dance and its sweet winsomeness out of the sea was rising lovely-crowned Kypris [Aphrodite], foam-blossoms still upon her hair; and round her hovered smiling witchingly Himeros (Desire), and danced the Kharites (Graces) lovely-tressed. And there were lordly Nereus' Daughters shown leading their sister up from the wide sea to her espousals with the warrior-king. And round her all the Immortals banqueted on Pelion's ridge far-stretching. All about lush dewy watermeads there were, bestarred with flowers innumerable, grassy groves, and springs with clear transparent water bright. There ships with sighing sheets swept o'er the sea, some beating up to windward, some that sped before a following wind, and round them heaved the melancholy surge. Seared shipmen rushed this way and that, adread for tempest-gusts, hauling the white sails in, to 'scape the death--it all seemed real--some tugging at the oars, while the dark sea on either side the ship grew hoary 'neath the swiftly-plashing blades. And there triumphant the Earth-shaker r[Poseidon] ode amid sea-monsters' stormy-footed steeds drew him, and seemed alive, as o'er the deep they raced, oft smitten by the golden whip. Around their path of flight the waves fell smooth, and all before them was unrippled calm. Dolphins on either hand about their king swarmed, in wild rapture of homage bowing backs, and seemed like live things o'er the hazy sea swimming, albeit all of silver wrought. Marvels of untold craft were imaged there by cunning-souled Hephaistos' deathless hands upon the shield. And Okeanos's fathomless flood clasped like a garland all the outer rim, and compassed all the strong shield's curious work. "And therebeside the massy helmet lay. Zeus in his wrath was set upon the crest throned on heaven's dome; the Immortals all around fierce-battling with the Titans fought for Zeus. Already were their foes enwrapped with flame, for thick and fast as snowflakes poured from heaven the thunderbolts: the might of Zeus was roused, and burning Gigantes seemed to breathe out flames. "And therebeside the fair strong corslet lay, unpierceable, which clasped Peleides once: there were the greaves close-lapping, light alone to Akhilleus; massy of mould and huge they were. "And hard by flashed the sword whose edge and point no mail could turn, with golden belt, and sheath of silver, and with haft of ivory: brightest amid those wondrous arms it shone. "Stretched on the earth thereby was that dread spear, long as the tall-tressed pines of Pelion, still breathing out the reek of Hektor's blood. "Then mid the Argives Thetis sable-stoled in her deep sorrow for Akhilleus spake; ‘Now all the athlete-prizes have been won which I set forth in sorrow for my child. Now let that mightiest of the Argives come who rescued from the foe my dead : to him these glorious and immortal arms I give which even the blessed Deathless joyed to see.’ Then rose in rivalry, each claiming them, Laertes' seed [Odysseus] and godlike Telamon's son, Aias, the mightiest far of Danaan men . . . [After their speeches, the chieftains awarded the armour to Odysseus]." "[Odysseus presents the armour of Akhilleus to his son Neoptolemos when the youth agrees to join the Trojan War :] ‘Gifts beyond words to thee the Akhaian kings shall give: yea, I myself will give to thee thy godlike father's arms, and great shall be thy joy in bearing them; for these be like no mortal's battle-gear, but splendid as the very War-god's arms. Over their marvellous blazonry hath gold been lavished; yea, in heaven Hephaistos' self rejoiced in fashioning that work divine, the which thine eyes shall marvel to behold; for earth and heaven and sea upon the shield are wrought, and in its wondrous compass are creatures that seem to live and move--a wonder even to the Immortals. Never man hath seen their like, nor any man hath worn, save thy sire only, whom the Akhaians all honoured as Zeus himself. I chiefliest from mine heart loved him, and when he was slain, to many a foe I dealt a ruthless doom, and through them all bare back to the ships his corpse. Therefore his glorious arms did Thetis give to me. These, though I prize them well, to thee will I give gladly when thou com'st to Troy.’"
"In his father's arms Akhilleus' son [Neoptolemos] clad him and lo, he seemed Akhilleus' self! Light on his limbs and lapping close they lay--so cunning was Hephaistos' workmanship--which for another had been a giant's arms. The massive helmet cumbered not his brows; yea, the great Pelian spear-shaft burdened not his hand, but lightly swung he up on high the heavy and tall lance thirsting still for blood." "[From a description of an ancient Greek painting :] Pyrrhos [i.e. Neoptolemos, son of Akhilleus] wears the armour made by Hephaistos, which Odysseus, regretting his own victory, has yielded to him. If one examines this armour he will find that none is missing of the representations in relief which Homer describes, but that the work of art reproduces all that Homer gives. For the representations of earth and sea and sky will not, I think, require anyone to explain them; for the sea is evident at once to the observer, since the craftsman has given it its proper colour; the land is designated by the cities and the other terrestrial things, and you will soon learn all about them; but here is the Sky. You see here, of course, the orb of the unwearying sun and the brightness of the full moon. But I believe you want to hear about the stars in detail, for the differences between them provide a reason for your inquiry. Here are the Pleiades, signs for sowing and for reaping when they set or when they appear once more, as the changing seasons bring them; and opposite them are the Hyades. You see Orion also, but the story about him and the reason why he is one of the stars we must defer to another occasion, my boy, that we may not divert you from the object of your present desire. The stars next to Orion are the Bear, or the Wain if you prefer that name. Men say that this constellation alone does not sink into Okeanos, but revolves about itself as a guard over Orion. Let us now make our way over the earth, leaving the upper regions, and let us examine the most beautiful of things on the earth, namely, the cities. As you see there are two of these. Which of the two do you wish explained to you first? Do the light of the torches, and the marriage hymn, the sound of the flutes and the twanging of the lyre and the rhythmic motion of the dancers attract your attention? You see also the women visible through the vestibules as they marvel and all but shout for joy. This is a marriage, my boy, the first gathering of the bridal party, and the bridegrooms are brining their brides. I shall not attempt to desire how modesty and desire are clearly depicted in each, for the craftsman ahs suggested this with great skill. But look! Here is a court of justice and a general session, and dignified old men preside in a dignified manner over the gathering. As for the gold in the centre, the two talents here, I do not know what it is for, unless, by Zeus, on may conjecture that it is a reward to be paid to the judge who shall pronounce true judgment, in order that no judge may be influenced by gifts to give the wrong judgment. And what is the case? Here are two men in the centre, one of whom, I believe, is bringing a charge of bloodshed, and the other, as you see, is denying the charge; for he claims that he is not guilty of that which the accuser brings against him, but that, having paid the blood-money, he has come free of offence. You see also the adherents of each man, in two groups, who applaud according to their preference; but the presence of the heralds checks them and restores them to silence. This scene, accordingly, represents a state of affairs midway between war and peace in a city that is not at war. The second city is walled, as you see, and those unfitted for war by reason of age guard the walls at intervals; for there are women at certain points on the battlements, and here are old men and even children. Where, pray, are their fighting men? Yonder you may find them--the men who follow Ares and Athena. For this is what the work of art means, I believe, indicating by the use of gold and by great stature that the leaders are gods, and giving to the others their inferior rank by this device. They are issuing forth for battle, having refused the proposals of the enemy, namely, that the wealth of the city be apportioned among them, else, if it be not so apportioned, it shall be the prize of battle. Accordingly, they are devising an ambush on this side; for that, it seems to me, is suggested by the thicket along the banks of the river, where you see men under arms. But it will not prove possible for them to profit by the ambush; for the invading army, having stationed some scouts, is contriving how to drive off the booty. Indeed, we see here shepherds herding their flocks to the music of pipes. Does not the simple and ingenuous and truly highland strain of their music reach your ears? But they have made their music for the last time; and through ignorance of the plot devised against them they die, as you see, for the enemy has attacked them, and a portion of their flocks is being driven away as booty by the raiders. A report of what has occurred has reached the men in ambush, and they rise and go into battle on horseback; you can see the banks of the river covered with men who are fighting and hurling javelins at the foe. What shall we say of those beings who pass to and fro among the combatants and of that Daimon (spirit) whose person and clothing are reddened with gore? These are Eris (Strife) and Kydoimos (Tumult), and the third is Ker (Doom), to whom are subject all matters of war. For you see, surely, that she follows no one course, but thrusts one man, still unwounded, into the midst of hostile swords, a second is being dragged away a corpse beneath her, while a third she urges onward wounded though he is. As for the soldiers, they are so terrifying in their onrush and their fierce gaze that they seem to me to differ not at all from living men in the charge of battle. But look again at the works of peace. This is clearly fallow land, to be thrice-ploughed, I think, if one may judge at all by the number of the ploughmen; and in the field the ploughman frequently turns the yoke of oxen back, since a wine-cup awaits the ploughman at the end of the furrow; and the plough's seem to make the gold turn black as it cleaves the soil. In the next scene you perceive a domain--a king's, as I think you may infer--and the king who attests the gladness of his spirit by the radiance of his eyes. The cause of his delight is not far to seek; for that the crop greatly exceeds the sowing is proved by the workers who busily cut the grain and by those who bind the bunches of cut stalks into sheaves, while others very zealously bring them more grain to find. The oak tree stands here not unfittingly nor without good reason, for thee is abundant shade beneath it for the refreshment of such as grow weary with their labour; and yonder fat ox, that has been consecrated by the heralds whom you see, is appointed as a meal beneath the oak for those who labour at harvesting the wheat. And what do you say of the women? Do they not seem to you to be full of excitement and to be encouraging each other to knead plenty of barley meal as a dinner for the harvesters? If there should be need of fruit as well, here you have a vineyard, golden for the vines and black for the grapes. The dark blue inlay of the ditch is the device, methinks, of the artificer to indicate its depth; and you have no difficulty in recognizing in the tin inlay the barrier surrounding the vines. As for the silver in the vineyards, these are props, to keep the vines which are laden with fruit from being bent to the earth. And what would you say of the men gathering the grapes? Making their way through this narrow passage they pile the fruit in baskets, charming persons of an age adapted to their task. For young men and maidens move forward in rhythm, with Euian and Bakkhic step, while another gives them the rhythm, one whom you doubtless recognize, not only from his lyre, but also from the fact that he seems to be singing softly to the lyre's notes. And if you should also notice the herd of cattle which press forward to their pasture, followed by the herdsmen, you might not, indeed, marvel at the colour, although the whole scene is made of gold and tin, but the fact that you can almost hear the cows lowing in the painting and that the river along the banks of which are the cows seems to be making a splashing sound,--is not that he height of vividness? As for the lions, no one, it seems to me, could in a description do justice to them or to the bull beneath them; for the bull, that seems to bellow and quiver, is being torn to pieces, the lions having already laid hold upon its entrails. The dogs here, I believe there are nine of them, follow the herd and at the command of the herdsmen who set them on they rush close up to the lions, wishing to frighten them by barking, but the dare not come to close quarters though the herdsmen urge them even to that. And you also see sheep leaping on the mountain, and sheep-folds, and huts and pens; you are to recognize herein the home of the flocks. One more scene remains, I think--a troup of dancers here, like the chorus which Daidalos is aid to have given to Ariadne, the daughter of Minos. What does the art represent? Young men and maidens with joined hands are dancing. But apparently you will not be content unless I go on and give you an accurate account of their garments also. Well, the girls here are clothed in fine linen and wear golden crowns on their heads; while the young men wear delicate thin chitons, and golden swords hang at their sides held by silver and golden swords hang at heir sides held by silver belts. But as they move in a circle, behold the result--you see in imagination the whirling of a wheel, the work of a potter making trial of his wheel to see whether or not it turns with difficulty. And as they advance again in rows, a great crowd of men approaches, who show how merry they are; for some who here in the centre are turning somersaults and exhibiting sundry kinds of dancing seem to me evidently to fill the dancers with wonder. The image of the sea on the circle of the rim is not the sea, my boy, but you are to imagine that Okeanos is designed by the artist to represent the boundary of the land depicted upon the shield. Enough has been told you of the scenes in relief." "Thetis his [Akhilleus'] mother secured armour for him from Volcanus [Hephaistos], and the Nereides brought it to him over the sea. Wearing this, hew slew Hector." "I'm asking a deity whom I reverence for arms . . . You [Hephaistos] were moved by the tears of Thetis once, and the tears of [Eos] the wife of Tithonus [i.e. to provide arms for each of their sons]." Thus saying, he gave his wife the love he was aching to give her; then he sank into soothing sleep, relaxed upon her breast. That was all Volcanos said : quickly they set to the business, shared out the tasks among them equally. Rivers of molten bronze and gold are flowing; the deadly steel is smelted in an immense furnace. They fashion a shield of heroic size, to withstand by itself every missile the Latins can use, welding seven round of metal one on another to make it. Some pump away at the bellows, drawing in air and expelling it; some dip the hissing metal in troughs. The cavern groans under the stress of anvils. They raise their arms with the powerful alternate rhythm of cranks, they keep the iron-ore turning in the close grip of their tongs. While on Aeolian shores the lord of Lemnos was hurrying forward his work, Evander was roused from his humble dwelling . . . Venus [Aphrodite] sent them a sign out of the clear sky. All of a sudden the heavens shook with a flash of lightning and thunder pealed : it seemed as if the whole universe suddenly tottered and Etruscan trumpets were bawling above them. They looked up: again and again a terrific crash resounded. Up there among the fleecy clouds in the fair-weather sky were arms, red-glinting and thunderously clashing through the clear air. The rest were stunned with amazement : but [Aeneas] the Trojan hero heard in the sound his divine mother keeping a promise she'd given. So then he exclaimed : ‘. . . My goddess mother foretold she would send this sign if war was looming close, and would come to my help through the air with arms of Volcanus' making.’"